The remainder of an employment site in Rotherham that was "sterilised" by HS2 proposals has been brought back to the market as the Government is minded to accept revised proposals that move the route through South Yorkshire. Home Décor Innovations, one of the leading suppliers of floor-to-ceiling sliding doors and associated storage systems in Europe, had only just opened its 110,000 sq ft state-of-the-art factory at Woodhouse Link, when in 2013, HS2 announced that a route for the high speed line to a station at Meadowhall would cut straight through the site, which is just inside the Rotherham borough. 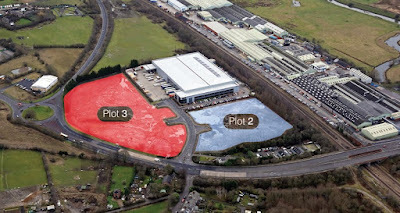 Developer Woodhouse Link LLP (a joint venture partnership with JF Finnegan and Laycast Ltd) undertook a complete demolition and remediation programme to facilitate a brand new industrial and distribution park on the site of a former foundry. Real estate adviser GVA has now been instructed to bring two remaining plots of land to the market which extend to around 2.98 and 5.26 acres. Outline permission was secured in 2009 for a mixed use development comprising A3/A4 (restaurant/pub), C1 (hotel), B1 (business), B2 (general industrial) and B8 (storage and distribution) uses. Rob Oliver, director at the Leeds office of GVA, said: "Woodhouse Link is a very well located employment site, and the two plots offer the opportunity to develop units of varying sizes. "Frustratingly, development and marketing went on hold when this site was on the proposed HS2 route, but thankfully it now appears that the route has been moved east of our site. "Despite not actively marketing the sites during this period, occupiers have regularly enquired after the site, but we have been unable to take those further. "I am now in talks with a number of developers who are interested in the plots, and look forward to seeing the remainder of the scheme developed in due course." Following a period of consultation, a final decision on the HS2 route through South Yorkshire is set to be made later this year.